Geeks in Cambodia has recently taken a look at how social media channels such as Facebook, Twitter and Snapchat are used in the Kingdom (or aren’t, in the case of Snapchat), and so we sat down with Roman Di Geronimo, a digital advertiser from QED who just received his Facebook certification, to learn more about what this means for the professional use of Facebook as an advertising and marketing tool in Cambodia. Roman Di Geronimo, the first Facebook certified advertiser in Cambodia. 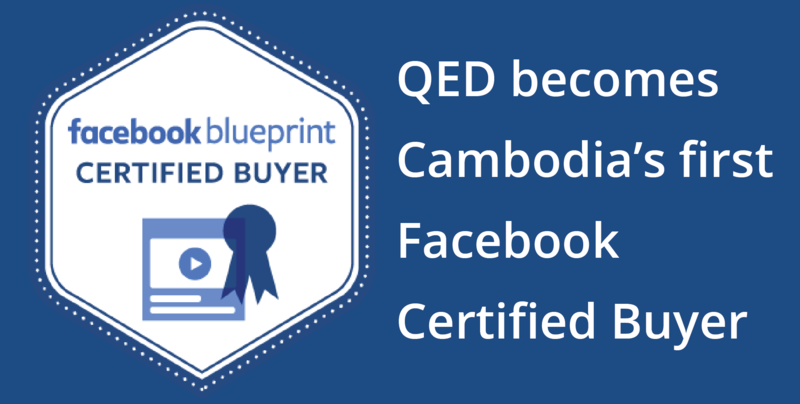 Firstly, what is the Facebook Blueprint Buyer Certificate? Roman: The Facebook Blueprint Buyer Certificate is the only certification officially recognised by Facebook. It is designed to test Facebook marketing expertise through rigorous exams, and it’s the most advanced level in their programme. The Facebook Blueprint Buyer certificate credits digital advertising professionals who demonstrate advanced proficiency in Facebook advertising, and aims to ensure advanced-level competency in managing creating and purchasing ads. Well done! Did it involve much studying? What did you learn during the process? R: A lot! I went through +150 hours of online resources and tests on a range of Facebook-specific skills, including Audience Insight, Facebook Pixel, Ads Manager, Business Manager, and Product Catalog. I learnt more about how to troubleshoot ads and optimise campaigns to lower costs and provide the best value for clients. There is also a huge portion dedicated to learning how to build compelling creative elements to get your ads notified while respecting Facebook’s strict standards. I certainly know more about the intricacies of Facebook now, and this is something I look forward to using at work. How will such knowledge help boost the professional use of Facebook in Cambodia? R: For what I’ve seen, Facebook is far from being used at its full capacity in Cambodia; too many advertisers relentlessly hitting the “Boosting” button on their posts and not understanding how Facebook works. Boosting (or using the Post Engagement objective) is only one form of advertising objective, with a specific purpose to generate engagement on the post. Yet it is often just used as a turnkey solution, regardless the real outcomes the business wants to achieve. For example, boosting a post won’t help drive people to your website, encourage people to watch your videos to completion, convey your message to as many people as possible, or increase your app downloads. There are 11 advertising objectives that Facebook offer to businesses, but only a few are being used here that I can see. I also unfortunately keep seeing many businesses still focusing on gaining always more and more followers with the hope to drive real business outcomes onwards. Again, gaining new fans should never be a main objective for brands. Likes do not mean much as Facebook controls communications with your customer, as I know Geeks has written about. It still surprises me that companies and agencies don’t seem to understand that simply collecting ‘likes’ doesn’t mean content or business engagement. How important is Facebook to the Cambodian marketing and advertising environment? Are there any alternatives? R: It is very important. The Geeks data on Facebook use shows that almost every Cambodian with a smartphone is also using Facebook in their daily lives, and this means that it is the perfect tool for reaching consumers with messages that they will hopefully enjoy. With the rise of e-commerce in Cambodia, Facebook will continue to gain even more importance for generating brand awareness, interacting with customers, and allowing online purchases. This is where the advanced retargeting functionality will finally be 100% valuable for businesses in order to re-engage people who have previously expressed a purchase intent from the brand and have not converted yet. Once last-mile issues are resolved in Cambodia, I think online payments and shopping will really take off here, and it will be an exciting time for Facebook marketers and brands. R: Yes, if you have to remember a few things! Focus on what you want to achieve. Is it reaching as many people as possible? Encouraging people to comment, share and like? Sending people to your website? Starting a conversation on Messenger? Making people to see the most of your video? It is always great to see firms and professionals in Cambodia gaining the skills and tools to improve the quality of services on offer, and we hope the awarding of Cambodia’s first Facebook Certified Buyer certificate helps to further push how brands and companies interact with people across the country.